Plants Vs. Zombies, the clever casual game from PopCap, can now grace the circuits of your iPhone or iPod Touch. As if you needed another excuse to use vegetation to eradicate lumbering waves of undead... 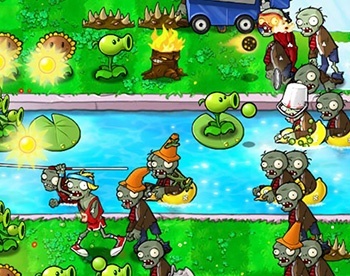 The mobile version of Plants Vs. Zombies delivers the same hilarious "flower-defense" gameplay as on the PC, but it is designed to take advantage of the iPhone's touch interface. There are also new features such as quickly jumping to a level after you've completed the 50-level Adventure Mode and "dozens" of achievements. You can pick up PvZ today on Apple's App Store or iTunes for $2.99. "Plants vs. Zombies for iPhone and iPod touch marks the first adaptation of our wildly popular 'flower defense' game to a new platform, and we're excited at how well it has translated to the iPhone and iPod touch," said Andrew Stein from PopCap. "We've stayed true to the original computer version with the full-featured gameplay of Adventure mode, and have optimized this adaptation around a seamless touch interface." The fact such a simple and fun game is now available on the iPhone might actually convince me to go out and join the Apple Hive Mind. Nah, I'll just wait for the iPad.